Today I went to my local quilt shop again (I seriously lucked out with this place being so close) and found the rest of my medium and dark fabrics for Gareth's quilt. 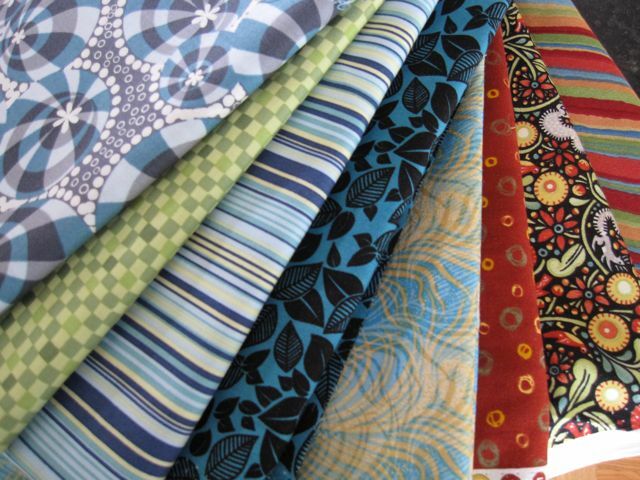 I was only planning on buying eight different fabrics total (and I already have two), but there were so many awesome options that I ended up buying a little less of these new ones in order to purchase more variety. 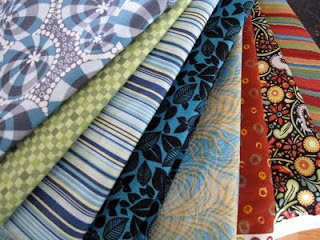 And even with ten fabrics there were some it was hard to give up. Going to the quilt shop on a Saturday is a must from here on out - it's such a rejuvenating experience when I don't have Gareth along with me! This particular shop is awesome in that they have a corner with toys to play with, so Gareth isn't pestering to leave or getting into all the fabric, but it's obviously still easier without worrying about him bugging everyone else. I'm excited to go back for my lights, but in the meantime I can start washing and cutting!